If you are looking for a job with a company that cares about your success, apply at Night Shift! We are always searching for exceptional people to join our team. Because of our commitment to being a trustworthy company, all Night Shift team members are carefully selected, beginning with an online application followed by a criminal background check a formalized interview. Each employee must complete the appropriate IRS tax forms, I-9 verification and provide proper documentation. In addition, each employee is provided with training so that you can learn new job skills and be proud of the quality of service rendered to each customer. At Night Shift we have extremely high standards and expectations of quality, dependability, honesty and reliability. No job is to small or insignificant. If you are servicing a customer - every job is our most important job. Detailed inspections are conducted on a regular basis to ensure that Night Shift's high standards are met. o MUST be capable of lifting up to 50 lbs (trash removal). o MUST have current drivers license & reliable means of transportation (mileage paid between locations if multiple locations worked). o MUST have dependable cellular telephone service. 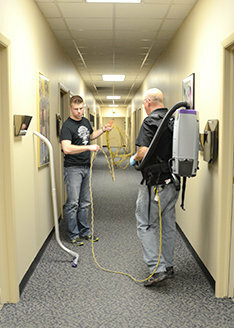 Night Shift uses non toxic cleaning chemicals and up-to-date equipment to protect your health and safety. As our name implies most clients prefer to receive service in the evening with a smaller number of contracts serviced during normal business hours. While Night Shift may not always have open positions, as long as you meet our requirements, we always keep applications on hand for when opportunities arise! o MUST be able to work independently. o MUST be able to pass a background check. o MUST take pride in work performed with a high level of detail required. o Cleaning experience preferred but not required.